VANCOUVER — It's been a big year for Canadian figure skater Keegan Messing, filled with competition, love and even a natural disaster. "It's just been an exciting year, honestly," said the 26-year-old. Messing placed 12th at the Winter Olympics in February, proposed on a mountaintop in October and felt his house shake as an earthquake rocked Alaska last week. But the skater said he isn't rattled heading into the Grand Prix Final in Vancouver this week. "It's the final. We don't have to qualify for anything else. There's no pressure," he said." We just get to go out, entertain the crowd and leave with smiles on our faces." Messing wasn't initially in the event's lineup, with his scores on this year's Grand Prix circuit qualifying him instead for the first alternate position. He gained a spot when reigning Olympic champion Yuzuru Hanyu of Japan dropped out with an ankle injury. "I'm really bummed that he couldn't make it, honestly," Messing said. "Injury's just one of those things that we have to avoid and dodge. And we all work so hard to be at the top of ours games." Despite Hanyu's absence, the men's competition will be fierce, featuring Japan's Olympic silver medallist Shoma Uno and reigning world champ Nathan Chen from the U.S.
Other Canadians — including Kirsten Moore-Towers and her pairs partner Michael Marinaro, and ice dancers Piper Gilles and Paul Poirier — didn't make it to the finals this year, leaving Messing the lone Canadian in the competition. "All of us have the potential to have qualified to make it here and all of us just fell a little short," he said. The finals wrap up a packed 2018 schedule for Messing, who went to his first Olympics this year. The Canadian contingent put on an impressive performance at the Pyeongchang Games, capturing gold in the team event and ice dance, and bronze in pairs and ladies. Messing followed South Korea with a series of appearances at international competitions, winning gold at the Nebelhorn Trophy in Germany at the end of September. 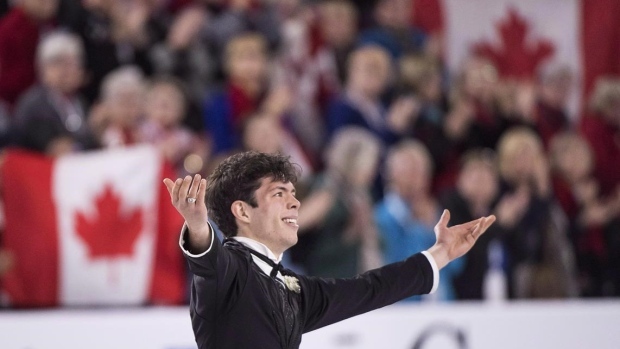 Then he hit the Grand Prix circuit and took home silver from Skate Canada in October — just two days after getting engaged. This season has held some disappointments, too, including a fifth-place finish at a Grand Prix event in Russia in November. Messing said he struggled to get his body feeling right after a 31 hours of travel, but learned how he could better handle similar situations in the future. This year has also held surprises. Last week, the Canadian-American dual citizen was at his home outside of Anchorage, Alaska, when the ground began to shake. Messing grabbed his fiancee and they stood in a doorway as items flew off the shelves around them. While the 7.0-magnitude earthquake destroyed a number of buildings and roads, Messing's home was relatively unscathed. The ice rink he'd built in the backyard hadn't even cracked. "We definitely got lucky," he said. Through out the year, Messing has continued to work on one particular element of his skating — the quad Lutz. The figure skater said he's been landing the jump in training all year but hasn't yet been able to stick it in competition. "It's kind of an evasive element right now," he said, adding that he hopes to break it out at the Grand Prix finals in Vancouver. While this year's frenetic pace could burn some people out, Messing has drawn energy from the constant competitions. "I was so ecstatic, so happy about the whole thing," he said. "I just wanted to keep skating, keep bettering myself and really, I haven't really stopped since the Olympics." Staying focused, he added, has been about managing emotions. "I've been skating for 23 years, so my body knows what to do," Messing said. "It's such a technical sport that your body has to be at 100 per cent to pull off these ridiculous jumps. It just kind of comes down to how you feel."